Remember Jeff Koons’ 12-foot tall balloon dog sculpture that sold at Christie’s last year for $58.4 million? Well, coinciding with his retrospective at The Whitney Museum, Koons has collaborated with H&M to make a limited-edition cross-body bag with an image of the dog printed on the front. For just $49.50, the bag is now available at the Swedish retailer’s newest flagship store on 48th street and Fifth Avenue, which opens today. 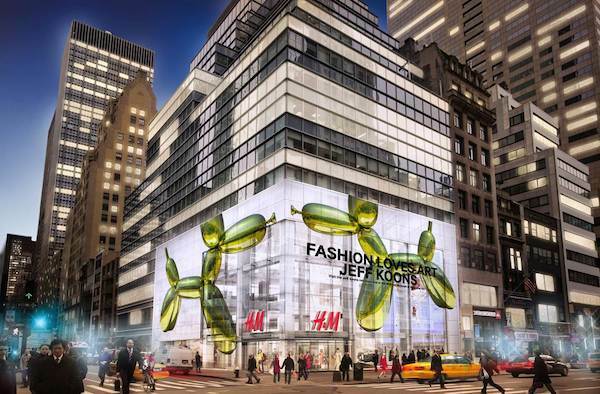 With a giant replica of Koons’ balloon dog and the phrase “Fashion loves art” stamped on the exterior of the six-story, 57,000 square feet store, this is the world’s largest H&M. Not only that, but H&M also gave Koons full responsibility of the interior design, and he’s curating a mini exhibit to celebrate his show at The Whitney inside the store! Jeff Koons: A Retrospective closes October 19, so be sure to check out both shows. The bag will be sold at select stores in New York, Chicago, Dallas, and Los Angeles.